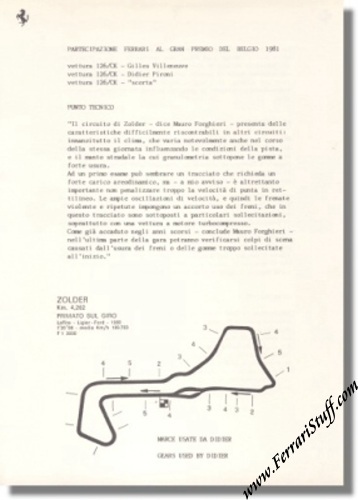 Vintage 1981 Ferrari press release on the Grand Prix of Belgium held at Zolder. Also shows a map of the Zolder track with the gear shifting points of Didier Pironi. Issued before the race for the motoring press in Imola. Gilles Villeneuve would finish the race in 4th position, 47.64 seconds behind winner Carlos Reutemann. Didier Pironi finished the race in 8th position, 1'32.04 seconds behind Reutemann.